For me, it’s simply to achieve my ultimate human potential. I’ve discovered something that I’m good at, and my quest is to be the very best that I can be through detailed analysis, wise planning, smart execution, an extremely strong work ethic, and a positive attitude. All of this is underpinned by surrounding myself with experts who contribute to the goal, and most importantly making sure that the quest I’ve chosen continues to bring me joy. Joy is an incredibly important part of this, and is an often overlooked aspect of people’s lives. I see many corporate executives who are on a quest to be “successful” without really thinking about what that means to them. Often, the focus is on status, money and possessions, neither of which directly result in joy. In my 20s and early 30s, I was obsessed with climbing the corporate ladder. I got promoted multiple times, and then at one point, when I was in a relatively senior position leading a global product marketing team, I looked at my boss and realized that everyone more senior than him spent an inordinate amount of time focused on their work. That’s what made them successful; regardless of how much they talked about work/life balance, the reality is that they were successful because they spent a huge amount of their energy focused on the job. I often think about the legacy that I will leave for my kids. The interesting thing that I observed, being around the kids of successful people in Silicon Valley, is that kids don’t care at all about money, or whether their parents are CEOs of some huge tech company. They are more impressed if their mom or dad can do a cool magic trick! Or at least, spend some time with them! When I was growing up, I was fortunate to have parents who worked from home, and could spend a lot of time doing cool things with me. On many days after school, I’d be practicing rugby with my dad or playing music with my mum. After I had kids, I realized that making time for them is one of the most valuable things that I could do. At the same time, when they look at what I’ve achieved in my life, it dawned on my that they couldn’t care less if I was “Senior Vice President of XYZ”, and that they would be more inspired by observing me accomplish feats of human performance. When I think about the lessons that I want my kids to learn, I want them to choose a path in life that brings them and others joy, I want them to choose a path that aligns with their god-given abilities and traits, and I want them to leave no stone unturned to reach their maximum human potential in that area. Whether is sports, art, music, science or entrepreneurship, I want them to have a strong work ethic, believe in themselves, and do everything in their power to achieve their goals. I want them to know that on their quest there will be really tough times, and really great times, but that neither of those lasts forever. Persevere through hardship, and bask in the happiness, but don’t let either of those affect you too much. I want my kids to choose things in life that bring them joy. Not to say that they never do things that are boring, difficult and unpleasant, but that the path they choose is one that will ultimately bring them joy. For me, I love riding my bike for hours, swimming in the ocean and running through hot lava fields. I realize that is certainly not for everyone, but it does bring me joy. I feel alive. In the throes of a competition like Ultraman I feel like my mind, body and soul are deeply connected, working in unison to push me towards my goal. This year, I’m better than last year, and the year before that. It’s a long, slow process of continual improvement that honestly has no end. I cannot see a time when I say “I have achieved my full potential”. But this year, I’m one step closer. Boulder 2018 has a new bike course. I think it will still be relatively fast, even though you have a few short, sharp climbs. Compared to previous years, there is less time spent on 36, and in 2018 you will descend Nelson road (FAST) instead of climbing it. Here is the strava route and here is the GPX file. I made the turnaround on Hygiene road at a place which will make the course 112 miles, so let’s hope the organizers do the same! Also, here is the course in Best Bike Split, which as the name suggests, will allow you to predict your bike split. Nelson eastbound – FAST – not technical but bring some extra balls since you may have a tailwind too. There are not really any technical sections – the time for good bike handling and confidence is on the Nelson and Hygiene eastbound sections, but they are not technical at all. Finally, enjoy the beautiful scenery! After burger phase, I adopted for pretty much the complete opposite – Vegan Phase. 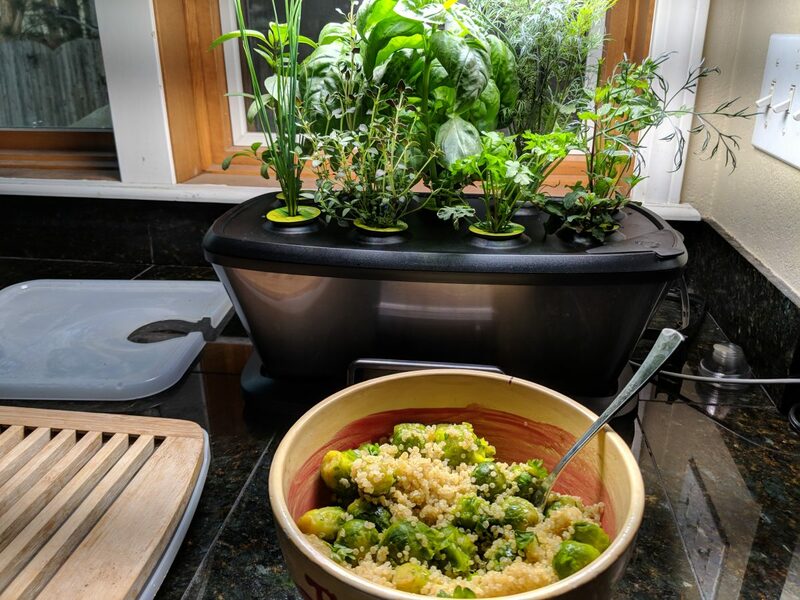 This project has changed from last year, where I only ate “bad” foods, to now focus on different popular diets and whether there is any material difference in how they affect my training, general well being, and weight loss (if any). It also helps me to be more empathetic with athletes that I coach who are following a particular diet. 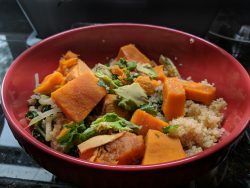 That was a big reason for choosing vegan, since I’ve never really excluded meat, eggs and dairy from my diet before, and I was interested in how it would affect me. I was still sticking to the calorie counting of 2000 calories per day, just to provide some consistency across the various diets. Ok so let’s focus on the last 2 points (calories and protein). Most people will be surprised when they see I did not lose any weight during the vegan phase. Most people report weight loss within the first 10 days of eating vegan. I believe the biggest reason for this is that they are not counting calories. If I had not been counting calories, I’d have been able to get away with about 1500 calories per day without feeling hungry. 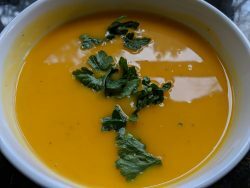 I’ve come to the conclusion that hunger is one of the best indicators of weight loss. If you’re not hungry, you’re probably not losing weight. If you want to lose weight, you should become comfortable with the idea of being hungry. The only times I’ve been somewhat satisfied and still lost weight was when eating a high protein diet. Talking of protein, I did find it really difficult to get in my goal of 0.7g per pound of body weight. I base the 0.7g on various research studies I’ve read over the years. It’s a hotly debated subject, and I’m not saying I have the answer, but it’s less than bodybuilders suggest, and it’s more than the “anti-protein people” whoever they are, suggest. From practical experience, that seems to be the right number for me if I want to maintain muscle mass during periods of high activity. I ate a lot of lentils, quinoa, and other plant-based sources of protein, but I’d struggle to get in over 80g protein per day. Sure I could buy supplements to get it easily, but I wanted to avoid supplements during this phase. Even at that level of 80g per day, I felt a lot of discomfort in the gut when eating that high a volume of lentils and quinoa. My recommendation for vegans would be to either supplement, or to become ok with eating eggs. Most vegans are vegans due to ethical reasons, but in my view there are good options for humanely raised chickens. Personally I am ok with eating eggs, so no problem there. 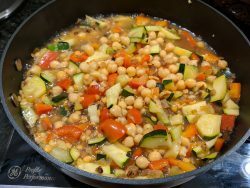 But I am also ok with eating meat, which is why the next phase I basically took my vegan diet and added dairy, eggs and fish back into it, thereby pretty much adopting the Mediterranean diet. 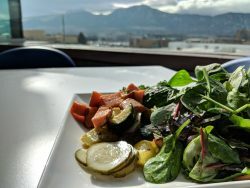 In my view, the med diet is the best one for me as an athlete. It’s largely based around vegetables, I feel very good all of the time, I recover well, and it’s easy for me to get enough protein without supplementation (although I have no issues with protein supplements and regularly take them for convenience reasons). Plus it is expected that one drinks red wine every night (in my interpretation anyway). Also, in my view there is no reason to avoid grains (such as in the paleo diet) or gluten (unless you have celiac disease). Since I am free from these afflictions, it works really well for me. Having said that, if you wish to be vegan I think it works really well, as long as you also supplement. 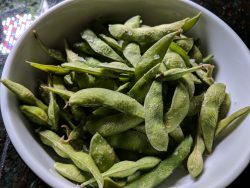 If you want a great source of protein, take a look at these good supplements from Arbonne. So overall this has been an interesting phase of the experiment. 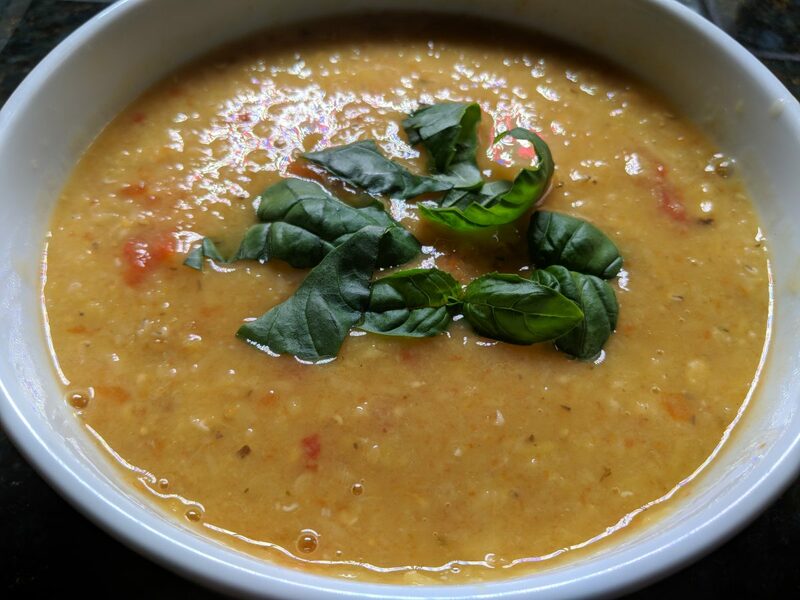 I’ve made some great tasting dishes and felt very good health wise. 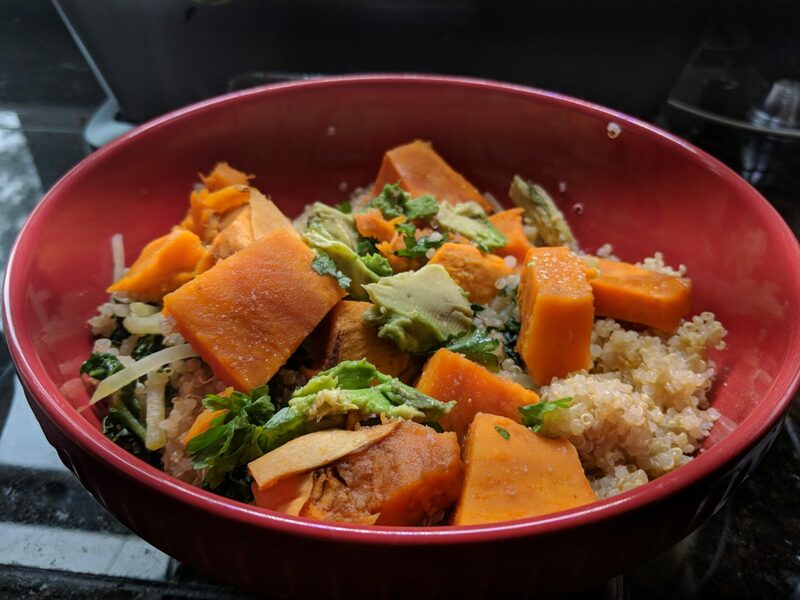 It’s not quite as fun as eating burgers or ice cream, but it is more enjoyable in the sense that I did enjoy eating good wholesome food for all my meals. home made burgers are very accurate because you can measure everything precisely. Chains like McDonald’s or Burger King have reasonably accurate calories, but who wants to eat there when you have much better options around! This year I had no chain burgers other than Red Robin, and I never had any homemade burgers. 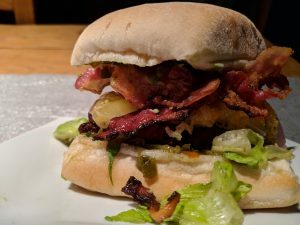 Despite the lack of success, I did have a great time trying some new burger places. Biggest surprise was Red Robin’s Mad Love burger, which despite being a chain restaurant was actually a phenomenal burger. Mountain Sun’s Junk Burger was fantastic. I’ve lived in Boulder for almost 3 years and (disgrace!) have never been to Mountain Sun. It was superb. I had several burgers from Ted’s Montana Grill. The Avalon is really good! Roadhouse Boulder Depot was great – I can’t remember the name of the burger but it was very good. Fate Brewing Trifecta burger has an amazing reputation, but did not deliver this time around. It wasn’t juicy at all, and the flavors just didn’t do it for me. Wendy’s was another great fast food option. The Dave’s Single was good, but the Baconator was not good at all. For the next phase, I’ve decided to go super healthy with a strict vegan diet. And no junk vegan stuff, just whole foods with nothing processed other than some Ezekiel bread, and rolled oats if you consider that processed. Protein is going to be a challenge, but I’m stocked up on lentils, beans, peas and quinoa so hopefully I can get enough in. I don’t plan on supplemental protein unless absolutely necessary. Someone recently asked me how I stay motivated throughout the year. Pondering my answer, I realized that I very seldom feel demotivated, which got me digging deep into my psyche to figure out why this is the case. Also, speaking to many of my friends who are professional athletes, it seems like many of them struggle a fair amount with staying motivated throughout the season. So why is it that I do not feel demotivated much, and is it something that can be learned or is it just an intrinsic part of my psychological make up? The answer was not immediately apparent to me, but upon some reflection I realized that there are several aspects to how I stay motivated, or looking at things another way, how do I not get demotivated? I don’t always expect to feel motivated. For example, once my most important race of the year (Ultraman World Champs) is done, I just enjoy Christmas and the New Year without even thinking much about any structured training. In fact, the only training I do is just whatever I feel like doing. I have no expectation to feel motivated, and I don’t need motivation in order to train. I just train if I want to, and if I don’t feel like it, I don’t train! So the thought of motivation never enters my mind. If I did feel compelled to train, that is when I might notice lack of motivation. But since there is no structure, there is actually no need to feel motivated. I have a big goal. My single goal of the entire year is to win the Ultraman World Championship. That is a big goal, that seems to motivate me when it really matters. When those days surface when I don’t even feel like getting out of bed, I just get up and do *something*. Once I start my workout, usually I feel much better about 30 minutes into it. At the back of my mind, I know if I can just execute day after day, I will have the edge on my rivals. Or at least they will have to also have extreme commitment in order to be consistent in their training and match me on race day. You can also have short term big goals, such as riding to the next state, or riding farther than you ever have before. I often throw in goals like that during the year as I think them up. For example, this year (in summer) I’m going to do a ride from Boulder all the way to Beaver Creek and then back the next day; a ride of 150+ miles each way with 25000 ft of elevation gain over the 2 days. I’m also flexible. The flip side of my previous point, is that if I still feel terrible 30 minutes into my workout, I’m going to just stop and take an easy day. There is no point drilling myself into the ground when I should be resting. So basically I listen to my body, but the 30 minute warmup is like the truth serum that helps my body be honest with me! Too many times I’ve felt terrible waking up and after 30 minutes of exercise I feel fantastic, even to the point of having some of my best workouts. I have rivals. 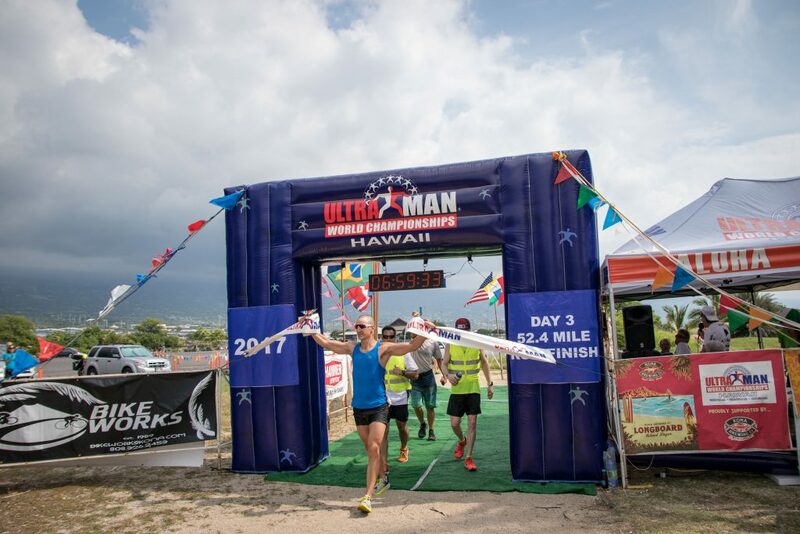 Going into the 2018 Ultraman World Champs, there are some fantastic athletes turning up. Inaki De La Parra who beat me in 2016, Petr Vabrousek who has completed 190+ Ironman races, David Hainish who is an absolute beast on the bike. Maybe even Chrissie Wellington, since she’s heavily into the Ultra scene right now. All these guys (or girls) that could be turning up motivates me every single day. I was doing a 3 hour ride indoors today, with 4 x 20 min intervals around half ironman pace. That was just such a grind and I wanted to stop, but the thought of my rivals kept me in the saddle, suffering to the very end. Be accountable to someone. The other thing that got me through that workout today was the fact that my bike coach would be looking at my workout. It would be easier to just get the workout done than to make up an excuse or try and explain myself. Other ways of being accountable could be to be part of a training group (because people are expecting you to turn up), or even just arranging to meet with a training partner drives some level of accountability. Those are just a few that I can think of; there are no doubt many more ways to stay motivated. The most important thing is that motivation comes from within yourself. If motivation comes from an external source, such as a motivational speaker, or watching an exciting event on TV, it will not last long. The trick is to use those external motivational sources to spark the flame, but then look within yourself to keep on putting wood on that fire! The ice cream phase of “race weight 2018” was a success! 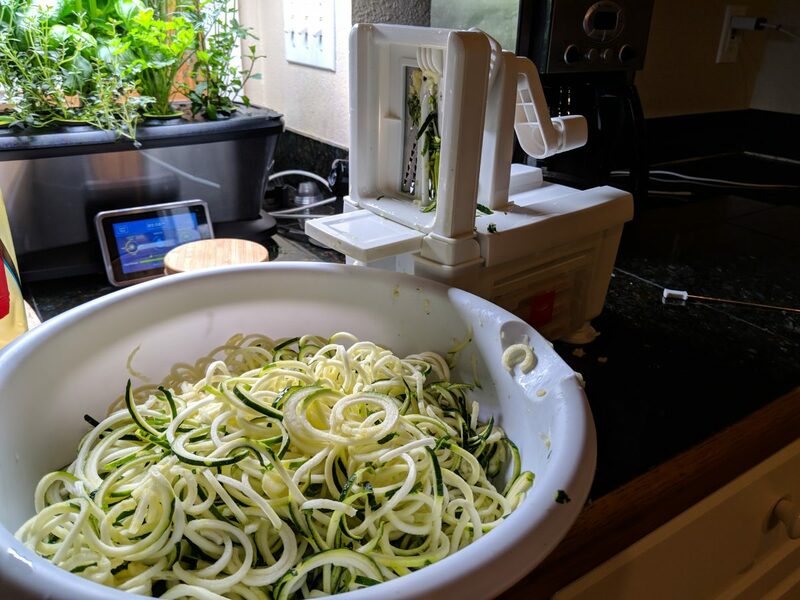 9.4 lbs (4kg) in 14 days is much more than I expected… I put it down to very low sodium (and therefore no water retention) and very accurate calories (it’s all packaged, with calorie values on the tub). Despite the rapid weight loss, it was not easy at all. I was hungry all of the time, so it took a lot of discipline not to eat more. 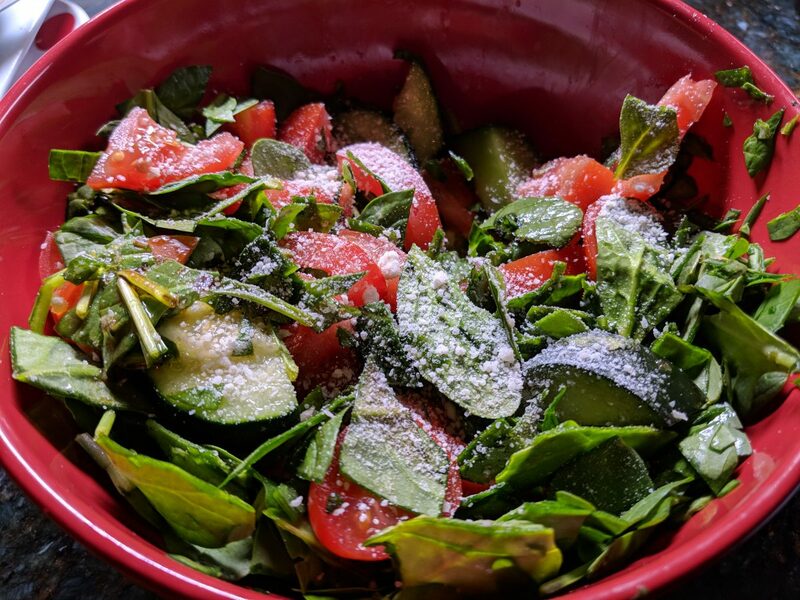 On the plus side, my “cheat meals” were very healthy – I’d have a bowl of fresh tomatoes with spinach some balsamic vinegar and a little olive oil. 150 calories max. I had that about three times during the 14 days (over and above the 2000 calories per day of ice cream). 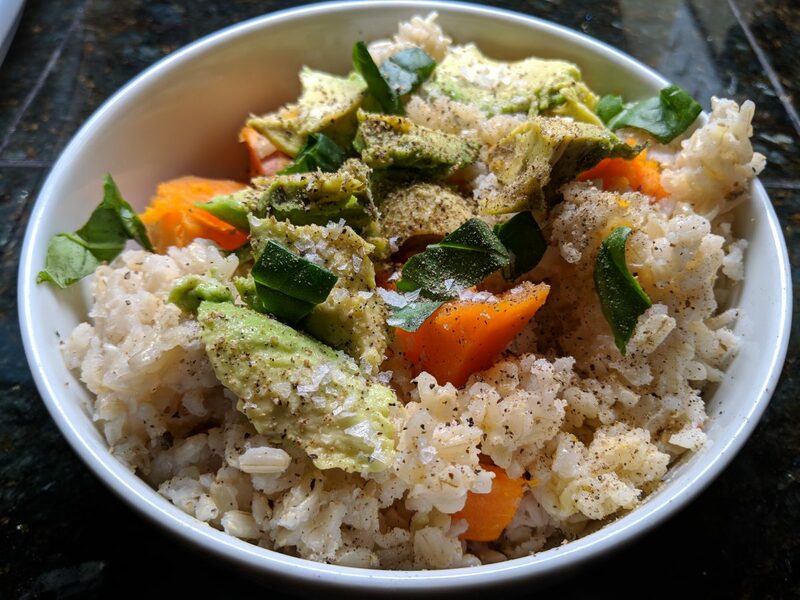 It feels really odd to have a cheat meal that is so healthy, but it’s honestly just as rewarding as when you have a bowl of ice cream during a normal diet where you’re eating healthy food all the time. Here is a long video that goes through all 14 days. I start with a short summary, so you don’t have to watch the whole thing. But if you want something to watch on an indoor trainer ride, then you have plenty of material there! Training went surprisingly well – I don’t think I had a single bike or run workout where I struggled. I did suffer on some of the swims, I think because they are such high intensity that if you have any caloric deficit you just fall apart. The same thing happens when eating normally, if I do a hard swim without adequate fuel. So not very different to normal. Training volume is relatively low – 12 hours for week 1 and 14 hours for week 2. With ice cream done, I’m very excited to move onto burgers, although I suspect the weight loss will be only 2-4 lbs over the 2 week period. However it will most likely be a lot more nutritious and satisfying than the ice cream phase. 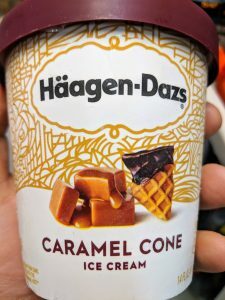 Having sampled a lot of ice cream over 2 weeks, I thought I’d list my favorites. Here are my top 5 of the 20+ that I ate. Onward and upward onto the much-loved burger phase! The first week of ice cream was a success. 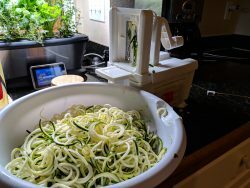 6 lbs lost which is more than expected. No doubt much of that (like any diet at the beginning) was some water weight, since ice cream has very little sodium, and with the restricted calories there is probably not much glycogen actually being stored. So week 2 will be a better indication of progress. 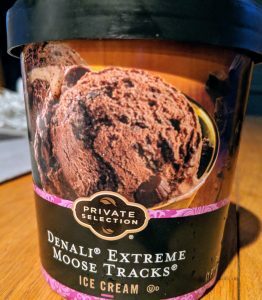 The two best ice creams this week were the Denali Extreme Moose Tracks, and the Caramel Cone. I feel quite good. Except for being hungry most of the time (actually a good sign you are losing weight), my workouts have gone well, and I haven’t felt undue fatigue during any of them. 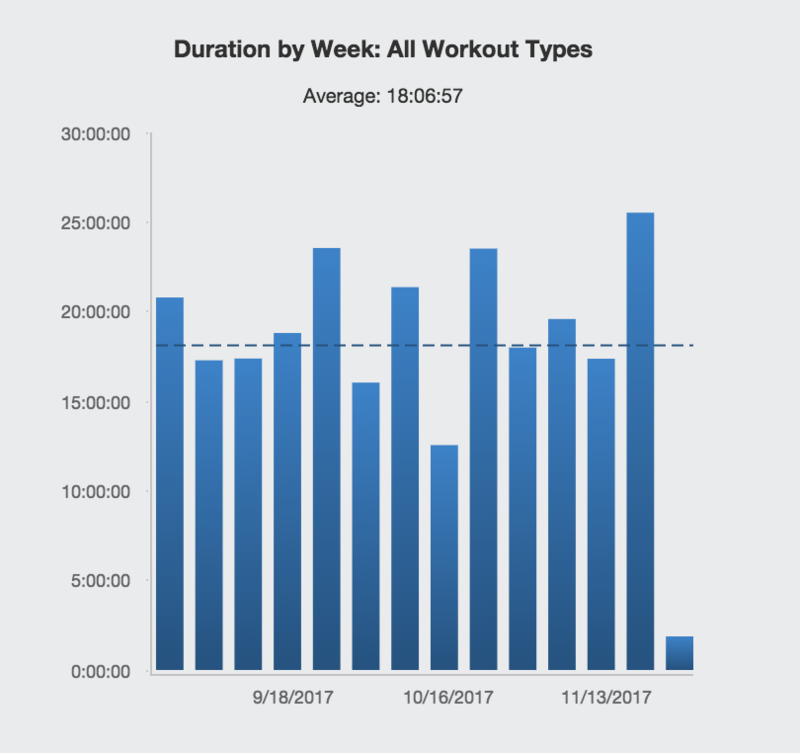 Training load is pretty light, with just 12 hours of training over the course of the week. I actually purposefully time the dieting with low training loads, because otherwise I find that I don’t have enough energy to train, and end up not losing weight despite a high potential calorie burn, because I have to eat more food to support the training. So now it’s just about waiting out the week and seeing how much I lose in total for the ice cream phase! 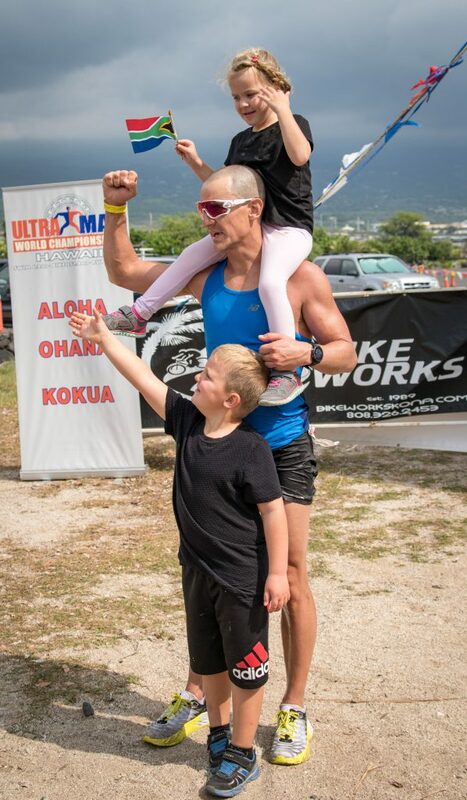 Through hard work, careful planning, smart racing, and a bit of luck, I was fortunate enough to claim the win in the 2017 Ultraman World Championship. In this race report I’ll give you an overview of the training that led to this win, as well as a recap of the race itself. First of all thanks to my crew Ian Hersey, Michael Bush and Cary Craig. And of course the extended crew Michelle who has to deal with me the other 362 days of the year! My ninja-mechanic Will Pennino of Roadworx. Ivan O’Gorman my local bike fitter (who continued the great base fit work I did with Jim Manton in LA). Darren de Reuck, Colleen de Reuck and Joanna Zeiger who run with me twice a week and have helped me really develop my run this year. Lisa Lessing and Monica Byrn for killing me in the pool 3 x per week. Matt Bottrill who regularly destroys me on the bike. And thanks to nutrition sponsor Glukos who have really looked after me, and anti-fog sponsor Sven Can See (with a 10k swim you can’t afford foggy goggles)! Also a shout out to Cuan @ Oakley for keeping my eyes sharp with the shades. 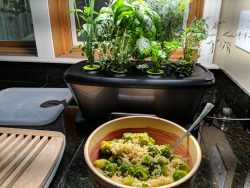 I decided to take a different approach this year, and focus on quality before quantity. 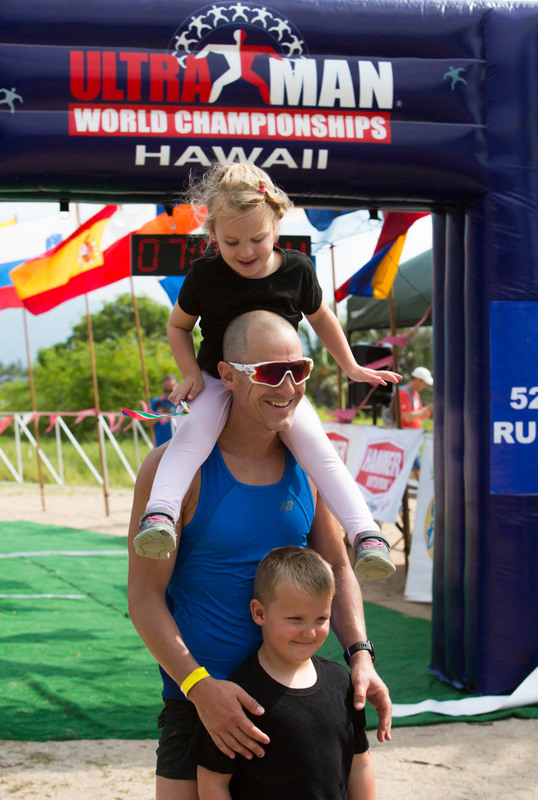 The main reason behind this, is that I have a lot of years of endurance racing under the belt, and I wanted to “undo” the slow run pace that I had developed as a result of that. Since the run was my downfall in 2016, I also spent a year focusing on run quality. I did very few long, slow runs, and aimed to do two hard group runs a week with Darren de Reuck’s Colorado Racing Club. Most of these group runs are about 10 miles, so what I would often do is run 8 miles to the group start, run with the group, and then run back home again. That meant my long runs would be 20+ miles, but the middle part is very high quality. I never ran more than 28 miles in training, and in the final Ultraman build my longest run was just over 20 miles. In the pool, I just swam with the masters group in Boulder several times a week, and supplemented that with some solo sessions. Most of the masters sessions were coached by Lisa Lessing or Monica Byrn, both of whom make me do a lot of work in that 4k of swimming! I also did some individual video analysis coaching with Eney Jones at Swimlabs who really helped me fine tune my open water technique. On the bike, Matt Bottril gave me some sessions that made me suffer like never before in the quest for glory, and I’m pleased to say that it paid off! Training volume may surprise you – most weeks were under 20 hours – the two biggest weeks were 23.5 hours. My average for the last 3 months was 18 hours per week, my longest run was 28 and my longest ride was 6 hours. I also made some changes to my bike setup. 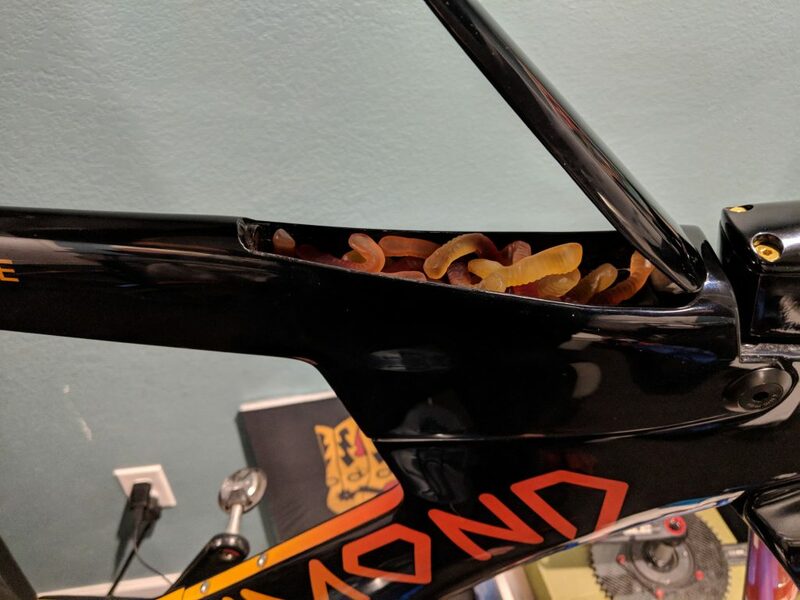 I moved from a medium Dimond to a small Dimond to get a lower stack, and I also moved to a 1X setup with a 56t chainring and an XTR (mountain bike) rear derailleur and 11-40 cassette. This has on the most part been a great setup, but on day 2 of Ultraman I dropped the chain 4 times, so I’m second guessing this decision a little. I used new extensions, the Zipp Vuka Stealth 110 which I really love. I experimented with an Enve bar but I ran out of time to get enough rides on it before the race, so I just stayed with the 3T Aduro bar on my primary bike and had the Enve on my spare bike. I really like the adjustability of the Enve bar, so I’ll probably swap them out for 2018. For wheels, I used a Zipp 808 on the rear and a Zipp 454 on the front (borrowed from crew chief Ian Hersey). The 454 is marketed as a wheel that handles very well in the crosswinds, and I can say that the marketing speak is true; it felt extremely stable even in very heavy winds. My goal for this race was to win. That was absolutely my mindset – that I would race to win. If it came down to a choice between racing hard to win, at the risk of blowing up and coming 10th, I’d rather fall apart in my quest for the win than play it safe and come second. My main competition was Tony O’ Keefe, 56 year old veteran of the race, Jeremy Howard who is a great swim/runner, and Arnuad Selukov who is actually very close to me over all 3 disciplines; he usually swims a bit faster than me, I usually bike a bit faster than him, and we run about the same. In both other Ultraman races that I’ve done, I was first out of the water, but for this race I was sure that Jeremy Howard would outswim me. I was right! I took off at a comfortable pace, and within the first 2k he was already about 300m ahead of me. There was another swimmer just ahead of me, which I thought was Arnaud Selukov, but later found out that it was actually Mauro Ciarrocchi. Even though Jeremy was a long way ahead, I didn’t panic and just swam at a solid tempo until the end. 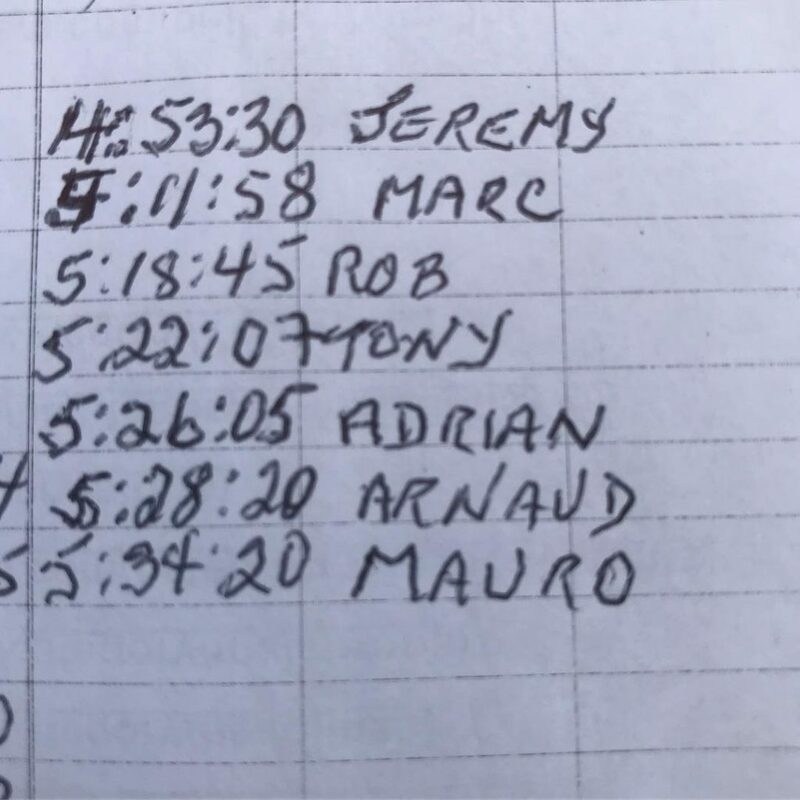 I exited the water 11 minutes behind him, 4 minutes behind Mauro, but 12 minutes ahead of Tony and Arnaud. I passed Maruo in T1 so I actually started the bike in second place. I was feeling really good on the bike, and had to dial things back a bit to stay within my power targets. About 10 miles in, I’d gained 4 minutes back on Jeremy so I knew I was going to catch him at some point. I passed him at 26 miles, and he didn’t look like he was having a good day on the bike. I just held a steady effort until the final 20 miles and then rode a solid tempo to the end. I did a short interview with Bob Babbitt and then waited for the other guys to come in. 17 minutes later, Jeremy rolled through. Arnaud arrived 38 minutes after me and Tony was 1:10 back. I felt comfortable with that amount of lead over Tony and Arnaud, but I knew I would need more than 17 minutes on Jeremy. 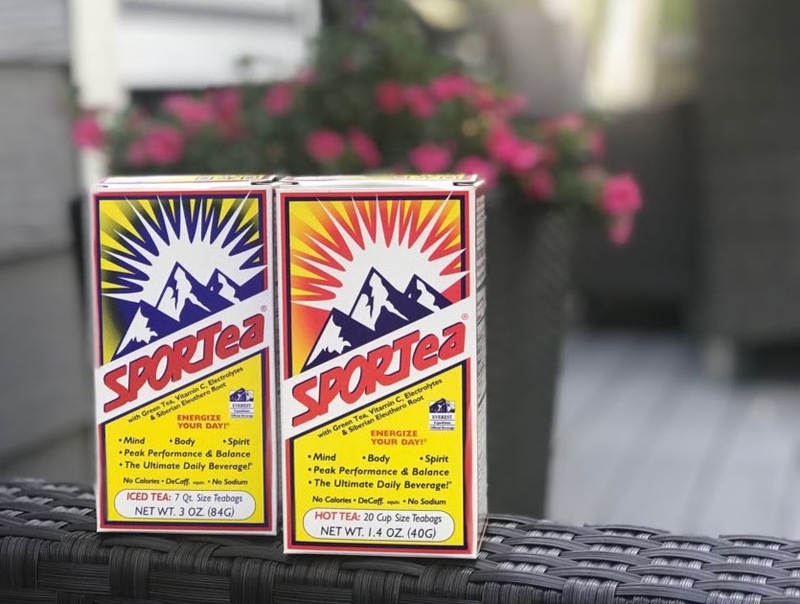 Nutrition-wise, I used my regular strategy of gummy worms, but for most of the day 1 bike I was using a new iced tea product called Sportea that I discovered by accident in my local grocery store. It’s a really fresh-tasting, energizing, but decaf-equivalent tea that is available in both hot and cold versions. Since then I’ve reached out to them and they’ve offered a discount code for first time buyers to try it out. You can find out more on my gear page. As usual it was wet and rainy at the start of day 2. It’s about 25 miles of downhill from Volcano to Hilo, so there is good opportunity to get some speed. My plan was to take it easy to begin with and try not to let a big gap open to whoever would go off the front. As we got rolling, Arnaud asked me if it was a controlled start, and I said “no mate, you can just go for it”, which he proceeded to do! Tony and I pushed a steady tempo and caught Arnaud after a few minutes. We stayed together until about half way down, when my chain dropped. Since we were going about 45 mph, I decided not to stop and just freewheel until my speed dropped off. That was 12 minutes of zero pedaling! I was still going reasonably fast (41 mph) but Tony and Arnaud were probably closer to 50 mph and they soon opened a fairly large gap of 1-2 minutes (they were out of sight so I’m not sure of the exact gap). At this point I wasn’t feeling that great, like I was still very much in need of a warm up, but I kept things steady and didn’t want to waste energy chasing them down so early in the day. I caught up to Tony at around mile 50 on the Red Road, and we rode together all the way to Hilo. At that point the gap to Arnaud was 5-6 minutes. As we approached Hilo, we got a time split of 4 minutes to Arnaud, which surprised me since I wasn’t riding very hard. We both just kept a steady effort and then got caught at a red light in Hilo that took 1.5 minutes to change (it felt more like 5!). 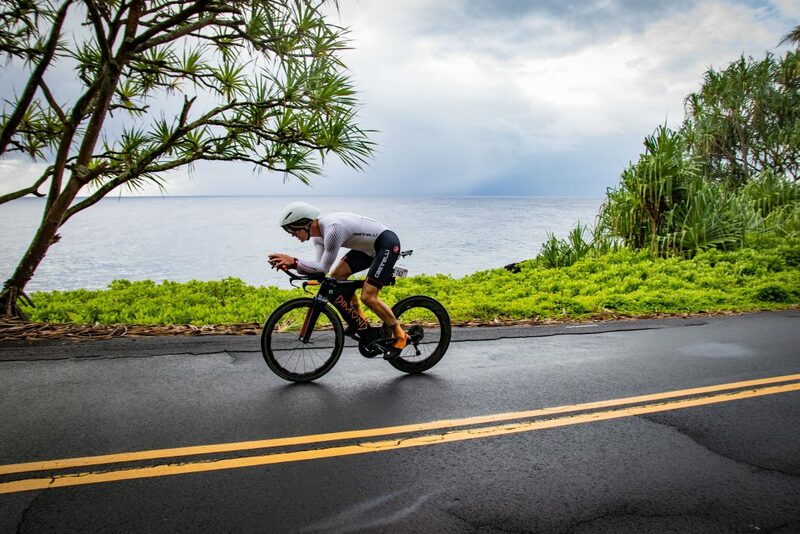 Once we got through Hilo, Tony dropped off the pace a bit and I started to focus my efforts on catching Arnaud. Since we had been closing on him before, I thought that if I rode just a little harder then I would catch him for sure. However, Arnaud had other plans! The next time split I got was 6 minutes, then 8 minutes, then 9 minutes. He was on fire! I started to push hard, but the legs just felt dead. At this point it was still raining, but as we got through Waimea and entered the Kohala mountains, the sun came through but of course accompanied by massive wind! I’ve ridden the Kohala Mountain road several times, but I’ve never experienced it as windy as this. At 77kg I’m relatively heavy, and the 40mph gusts were pushing me all over the place. One of my athletes Amy Craft was also racing. She’s very light and all I could think about was how it was going to blow her all over the road. I’m pleased to say that she battled through it and emerged in one piece. Near the top of the climb, I got a split on Arnaud of 8 minutes. So I had clawed only a minute back on the climb. The final 14 miles is a long, fast, and technical descent on sketchy road surface down into Hawi. It feels a little bit dangerous at the best of time, and now it hard started drizzling again and the wind was and I knew he was going to descend faster than me (because he had to, and also he’s a great descender). I played it super safe on the 14 mile descent into Hawi, with my primary goal now being to get to day 3 alive. I rode the brakes all the way down, and by the end they weren’t really working at all. The lack of braking also affects the speed at which you can descend, since you’re unable to brake in time for tight corners. So I just kept it safe, with a max speed of just 35mph (for comparison, Arnaud hit 55 mph down there). 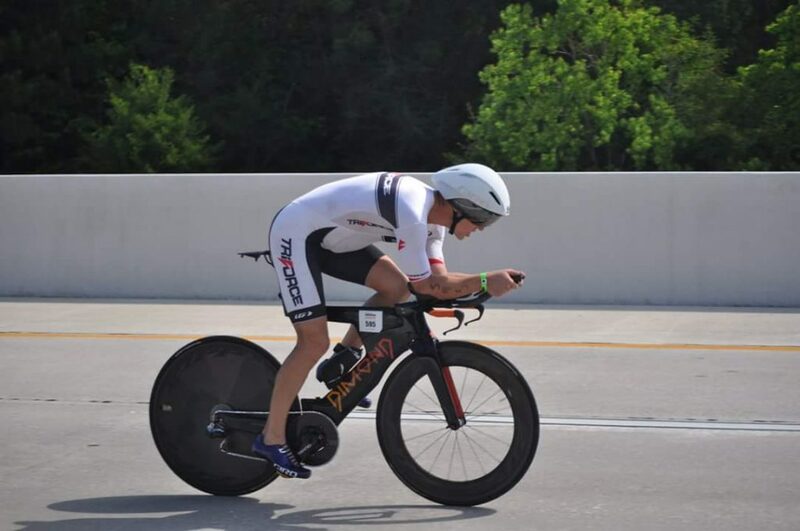 I’ve never been a fan of disc brakes for triathlon, but for this race I think there is a good case to have them. I ended 14 minutes behind Arnaud, but 24 minutes ahead of Jeremy. So overall I had 24 minutes on Arnaud and 40 minutes on Jeremy. Since I knew Arnaud and myself run about the same, I was mostly concerned about Jeremy. My estimation was that he would run about 6:45 on the day 3 double marathon, and I thought that my realistic time would be something like 7:15. That didn’t leave much room at all for anything to go wrong. In 2016, I suffered from severe quad failure at mile 38, and pretty much had to walk it in. This year I really wanted to avoid that. Besides doing a lot more downhill running in training, I also decided to revert to the run/walk plan that took me to the win in Florida. 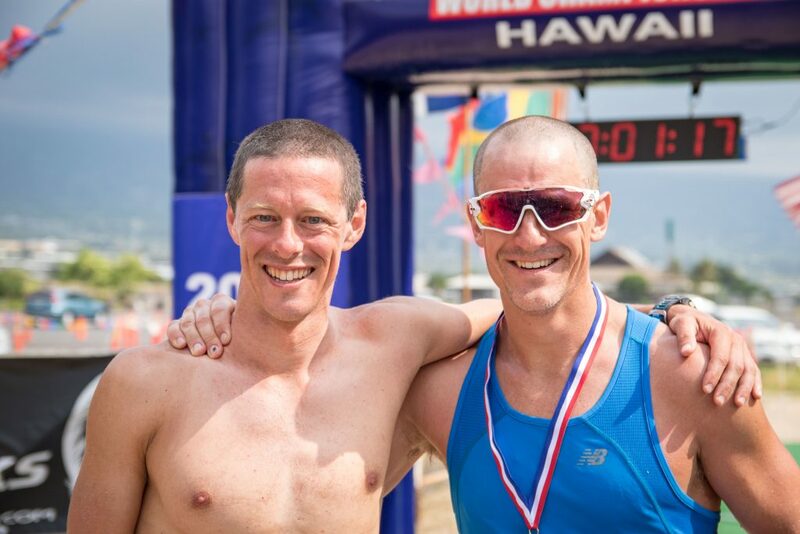 I spent a fair amount of time debating the right strategy with Ultraman Australia winner Richard Thompson. He would make suggestions, I would try it in training, and then make some tweaks to the plan. I eventually ended up doing exactly what he suggested in the first place! I did my first walk break just 2 miles into the race – and I have to say that people thought I was completely smoked. Other crews looked at me in pity as they saw me “struggling” so early on in the race. But my crew kept me in check and made sure I stuck to the plan. At the 10k mark, Arnaud was already 7 minutes ahead of me. Instead of panic, this actually filled me with hope. I’ve been there, done that, and it did not end up well. 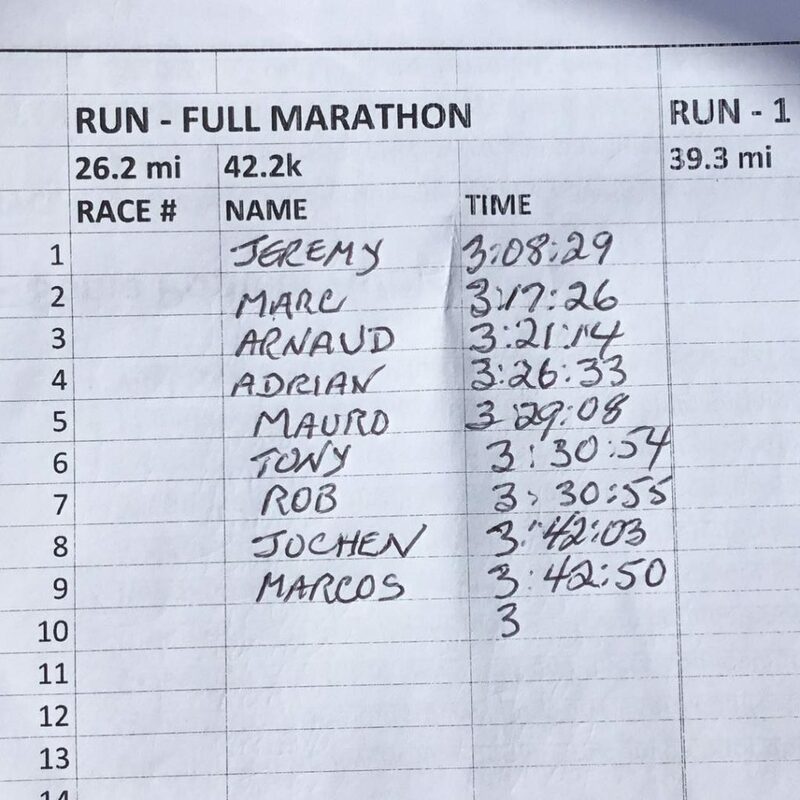 By the half marathon mark, Jeremy was 14 minutes ahead and Arnaud was just over 12 minutes ahead. At that stage I just kept to the plan of sticking to 8 minute miles. Slowly but surely I started moving up the field, passing one runner at a time, catching up to Tony just before the marathon mark. At this stage, we were just under 10 minutes behind Arnaud, but over 22 minutes behind Jeremy. 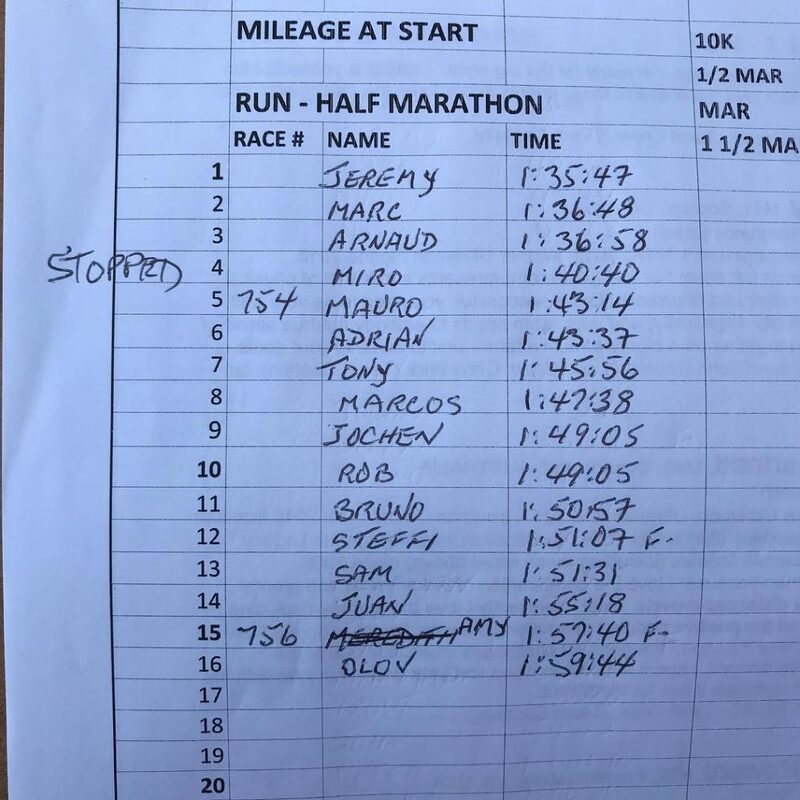 If both Jeremy and I continued at the same equivalent paces, he would win by 4 minutes, so I would have to step it up a bit in the second marathon if I wanted to close that down. I felt like I still had another gear, but still I held back and just kept to the plan. I know how hard it gets after Scenic Point, so I wanted to keep some in reserve in case I needed it. Talking about Scenic Point, that’s where I made the pass on Arnaud, exactly at the point where Inaki passed me in 2016. He looked like he was struggling but at least he was still moving forward. I really love his gutsy performance – he was willing to risk it all for the win which I really respect. By mile 39.3, I’d moved into 3rd place on the run. Jeremy was 25 minutes ahead, so I’d managed to hold the gap relatively constant over that third half marathon. With 10 miles to go, I stopped the walk breaks. I could tell that they were no longer helping, and when I was forced to stop (at a red light) it was very hard to get going again. So I just kept things ticking over and focused on running with good form. Ian Hersey was still pacing me, and was repeating the mantra “fast, light, smooth” and something else that I can’t remember now. That really helped me to stay in the moment and just focus on moving forward in an efficient way. It’s also helped running with Colleen de Reuck twice a week, since her gazelle-like run form is ingrained in my mind. When I started losing form, I would just imagine running like her, and immediately things would pick up again. I got word that Jeremy had finished in 6:24 – holy crap that is fast! So I now had a target time of 7:04 or faster to secure the win. Doing the math, I basically had to hold 8 min miles for the last 5 miles in order to get it done. I was still feeling good so I picked up the pace a bit. It felt like I was running about 7:30/mile, but my garmin was saying that my pace was 10:15/mile. After a mile or so I called out to Ian to give me his Garmin pace. He assured me that we were running faster than 8:00 pace, so from then on I ignored the Garmin pace, went old school and just hit the lap button every time I saw a mile marker. At mile marker 96 (about 4 miles to go), Ian started cramping so he gave me my water and he stopped on the side of the road. Unbeknown to me, the crew was actually running low on water, so he had stopped drinking in order to make sure that I was well taken care of. It must have killed his soul seeing me extravagantly pouring precious water all over my head while he was dying of thirst. I am totally in his debt for the sacrifice that he made for me to take the win. With about 2 miles to go, it felt like I was going to start cramping so I proactively took one of those HotShot drinks that we get for free at Ironman races. I have no idea if it works or not, but I got to the end without suffering any cramps. Mile marker 99 is located just before the Makala Rd turn, which I think is about a mile from the finish. I still had about 11 or 12 minutes in hand, so at that point I knew that I could take the win as long as nothing went wrong. I focused on not running too fast, since it did feel like I was on the verge of a cramp. As I made the turn into the Old Airport, my watch read 6:57 – I said to my crew that if we hit the gas I’d make it under 7 hours. So with about 500m to go, we hit a high tempo all the way to the finish line. I dipped under 7 hours with a finish time of 6:59:33 – even better is that I managed to negative split the double marathon (3:30 for the first one, and 3:29 for the second one. 2018 is going to be an interesting race… Inaki will be back to race me head-to-head, and rumor has it that uber biker David Hainish who won Florida this year will be making an appearance.